NASA is poised to launch its Soil Moisture Active Passive satellite from California on Jan. 29. The satellite is designed to monitor Earth's soil moisture around the globe. 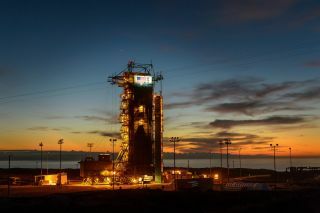 NASA is scheduled to launch its next Earth-observing satellite today (Jan. 29) from California, and you can watch the liftoff live online. The agency's Soil Moisture Active Passive satellite (SMAP), designed to provide unprecedented data about Earth's soil moisture, is scheduled to launch from Vandenberg Air Force Base in California on Thursday (Jan. 29) at 9:20 a.m. EST (1420 GMT). A United Launch Alliance Delta II rocket will carry the probe to orbit. You can watch the SMAP launch live on Space.com starting at 7 a.m. EST (1200 GMT) Thursday via NASA TV. Officials are predicting an 80 percent chance of good weather for launch. "With data from SMAP, scientists and decision makers around the world will be better equipped to understand how Earth works as a system and how soil moisture impacts a myriad of human activities, from floods and drought to weather and crop yield forecasts," Christine Bonniksen, SMAP program executive, said in a statement. "SMAP's global soil moisture measurements will provide a new capability to improve our understanding of Earth's climate." SMAP comes equipped with a giant, rotating mesh antenna, and at nearly 20 feet (6 meters), it will be the biggest of its kind ever flown in space, according to NASA. The satellite will peer into the top 2 inches (5 centimeters) of Earth's soil to track its moisture, allowing forecasters to potentially get a better sense of areas at high risk for drought and flood. "A flood follows a heavy rainfall — but only if the ground cannot soak up the rain. Waterlogged soil makes a region more flood-prone," NASA officials wrote in a news release. "Going to the opposite extreme, a drought can parch soil to such an extent that plants are unable to grow even after a few rains have fallen. Knowing soil moisture allows hydrologists to make better decisions related to the risk of flooding and drought, such as how much water to retain in reservoirs." The Delta II rocket will also carry four small cubesat satellites to orbit with SMAP. The cubesats, created as part of NASA's Educational Launch of Satellites program, will explore a variety of science investigations. EXOCUBE and the two FIREBIRD (Focused Investigations of Relativistic Electron Burst Intensity, Range, and Dynamics) satellites will explore space weather, while GRIFEX is a technology demonstration. SMAP will orbit about 426 miles (685 kilometers) above Earth's surface, and is the fifth of five NASA Earth-observing satellite launches initially expected to take flight in 2014. NASA's Orbiting Carbon Observatory-2 satellite, Global Precipitation Measurement Core Observatory and ISS-RapidScat all got off the ground last year, with the agency's Cloud-Aerosol Transport mission flying to space earlier in 2015.